Who needs a turntable from this group: Those desiring a single turntable to play electrical 78s for transfer or critical listening; in most cases LPs for critical listening, albeit perhaps at a somewhat lower level than with Group I turntables; and some records from the middle acoustic era forward more casually. Who doesn't need a turntable from this group but might want one anyway: Those interested, casually or otherwise, in 78s only from about 1930 forward and with a separate dedicated turntable for LPs; those wanting a good, basic LP turntable (or, in some cases, better) and interested in starting a collection of 78s later. Who should look to one of the other groups: Those who wish to play substantial numbers of pre-electrical records for transfer or critical listening, regardless of other playback needs, should look only to Group I. Those wishing to play 78s only at the most casual level and already having a turntable for LPs should look to Group III (subject of the next article in this series). In Part I, we considered desirable characteristics in a turntable for the 78 collector, particularly the 78 collector who wants a single turntable to do everything. Part II discussed several choices that approach that ideal more or less closely. This article, again with a focus on what might be termed “vintage” or “near-vintage” models, moves on to turntables that stray from the ideal enough to begin limiting what they can play correctly. Now, before the blistering defensive e-mails start flying, please allow me to emphasize that they are not “bad” turntables. Not everyone needs all the "ideal" features, and any of these units, depending on what the owner plans to collect, might make a good, economical entry point or even long-term investment. If in good working order and fitted with an appropriate cartridge, these turntables are at “entry level” quality or better for LPs—solid, serious equipment worlds removed from the bottom-end plasticky nostalgia players and such available in department stores today. They simply fall short of the flexibility necessary to play all 78s, their common failing being that while they offer some speed variability, it is insufficient to cover the full range of acoustic era records; were any equipped with a comely, affable, minimally clad assistant, she would spend a lot of time on her iPhone and not reliably notice when you asked for her help. Be that as it may, if a collector has restricted or no need to play records from the period before 1930, choosing a turntable from the first group may well incur needless expense, rather like buying a full-fledged four-wheel-drive car just for trips to the mall and grocery store in a mild climate. Such collectors take in a lot of territory. They include those interested solely in things like, say, big band music from the ‘40s, early rock and roll from the ‘50s, jazz on early Blue Note from across both those decades, or opera or solo piano music from the ‘30s on. By then, “78” had really come to mean “78” in the overwhelming majority of cases, and a small amount of speed adjustment would suffice to handle any outliers. For example, the Victor engineers inadvertently set their cutting lathes to run at about 76 RPM for Jascha Heifetz's 1930s vintage recording of the Prokofiev Second Violin Concerto with conductor Serge Koussevitzky. Any of these turntables would have enough speed variability to correct for the discrepancy. At the outer edge of their speed range, they could also adjust for the many Victor acoustic recordings cut at 75 RPM, and they could easily reach the 80 RPM nominal speed of Edison and acoustic Columbia records. They would not, however, have enough to reach the 90 RPM or more needed for center-start acoustic Pathe discs, the 84 RPM speed of that concerto on Edison Bell that I mentioned in Part I, or the low 70s speeds or slower needed for some early recordings, like the first ones by Enrico Caruso. Collectors whose interests lie in those directions will need turntables more in line with the ones discussed in Part II. Dual 10xx, 12xx series. A personal digression: when I finished my secondary schooling in the late 1970s, I had already been an avid 78 collector for half a decade, and I had four clockwork phonographs to my name, but my knowledge of electronic playback gear was practically nil. I suppose I'd have known more if my parents had been interested in audio gear, but aside from buying a KLH compact stereo that was much better than I recognized until years later, Dad limited his excursions into matters audio to coming home from work with a new record (usually a novelty tune or something like Herb Alpert and the Tijuana Brass—remember them?) or the year's special tire or carpet store Christmas record (remember those?). In other words, he and Mom played their stereo but didn't follow stereos. Nor were any of my friends my own age audio hobbyists, save for a few who, like me, had caught the “antique record” bug, and they, like me, were adherents to mechanical playback. Well, college exists to broaden the mind, and my attendance certainly broadened mine where audio was concerned, because for the first time I was exposed to component audio systems. As I learned about the existence of stereo components, I could not help but notice that turntables with a 78 speed were, or at least appeared to be, largely going the way of the dinosaurs. Needless to say, as the owner of what was already a fairly large 78 collection, I couldn't just sit idly by and watch that happen. And so I scraped together bits and pieces of impoverished undergrad change, visited the used equipment annex of a local chain stereo store (remember those?) that took trade-ins, and made my very first purchase of a stereo component, a well-worn Dual 1218 turntable. (“Aha!” I hear you cry. “Relevance at last!”) That's how I lost my audio equipment virginity, my first tentative step down that well-trodden, dissolute road that eventually would leave me with an STD (of the Strathclyde 305D persuasion—see Part II!). To business. 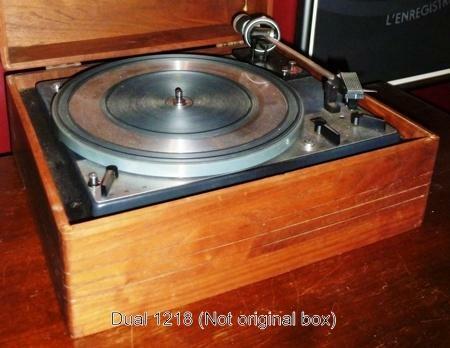 Dual turntables can be divided into several model series, of which the first two have value to 78 collectors. The earlier was the 10xx series: 1005, 1006, etc. but with some numbers omitted, up to 1019. All had a 78 speed and, I think, limited speed variability. The follow-on 12xx series started with 1209 and ran to 1264 with many omissions along the way. The 1209 through 1219, 1229, and 1229Q all had a 78 speed with some adjustment; the 1224, 1225, 1226, 1228, and all after the 1229Q offered only 33 and 45. Among those playing 78s, only the 1229 and 1229Q had a built-in strobe, and that would tell the user only whether the platter was running fast, on, or slow relative to the fixed speeds. As far as I know the “three digit” (4xx, 5xx, 6xx, 7xx) and CS (CS 130, CS 410, etc.) series tables were all two-speed models except for the 410, a rarity apparently produced outside Dual's regular sequence, and the last CS models, the CS 5000, CS 7000, and Golden Stone. We'll hold these four models for the next article in this series. Like Lenco, the Dual 78 RPM-capable 10xx and 12xx tables are idler wheel designs, but unlike Lenco, Dual set the idler tire to run horizontally on the inside of a flange extending vertically from the platter's underside. Speed is selected by turning a lever that mechanically shifts the idler up or down along a stepped drive shaft, each step representing one of the fixed speeds, with fine adjustment of 6% each way possible by turning a little knob on the bedplate to raise or lower the motor speed slightly. Also unlike Lenco, and for that matter all the others mentioned so far in this series, Duals are “automatic” turntables, meaning they are equipped with an elaborate system of levers and cams that raise the tonearm and return it to its rest at the end of the record. If fitted with a tall spindle that incorporates little retractable fingers to support a stack of records, the Duals can operate as changers, dropping each record in turn and setting the arm down at the correct place for a 7”, 10”, or 12” record as preselected with a lever; the mechanism cannot handle stacks of mixed sizes. If fitted with a short spindle, these tables provide for a manually cued start by hand or with a damped cuing lever but still automatically raise and return the arm at the end of the record. Pro: Dual seems to have been the component turntable of choice for the sort of ‘60s and ‘70s hi-fi enthusiasts who bought amps from H.H. Scott or Fisher and speakers from AR or KLH when those companies were still run by their founders as independent concerns. They also do not appear to have become cult objects like Lenco. Hence, they are far more commonly available than Strathclyde or Fons; their prices have remained moderate; and repair parts, if not exactly simple to come by, are available. These turntables have a couple of features lacking in all others discussed so far: their spindles are removable, raising the possibility of manually centering eccentric pressings, and at least the later ones make provision for easy adjustment of vertical tracking angle by way of either a knob on the headshell or on the baseplate. Build quality of the mechanisms is solid, although sometimes the plinths are a bit sketchy. Heavy platters make for good speed stability. Duals all came with pre-mounted arms, which range from passable to pretty good, and even the lowliest is likely to track better than anything you'll find on a stock Lenco. I wouldn't care to play a valuable LP with the heavy arm of a Dual 1009 F, but, while recognizing it isn't up to SME standards, I'd have few qualms about doing so with the gimbal-mounted arm of my 1218. Dual turntables featured removable headshell components (but see below). Some of the earlier models included 16 RPM, and all had a relatively small footprint. Negation: The Dual tonearm is fitted with a headshell that features a removable cartridge carrier, sometimes called a “sled,” of unique design. Headshells with the readily available standard SME type mount are incompatible, and the Dual carriers are somewhat hard to find and expensive, although less so than headshells for the Lenco stock arm. Perpetuum Ebner (P/E), Elac/Miracord (a.k.a. Benjamin Miracord in the United States). These brands were contemporary with the 10xx and 12xx Duals but turn up much less often, at least in the United States, and I have very little experience with them. Regarding P/E, please note that a new company, WE Audio Systems, has begun releasing turntables under this old name, but they are strictly two-speed models. The original P/E had a 78 speed with 3% speed adjustment, barely enough to reach 80 RPM acoustic records and not quite enough to get down to the 75 RPM common with Victors. An interesting feature not found on any other turntable of which I'm aware was a little plunger sticking out of the platter near the spindle. If the plunger was in the “up” position, the tonearm was locked vertically, protecting the stylus from inadvertent damage by dropping the arm with no record on the platter. Placing a record on the platter would depress the plunger and release the arm. Elac/Miracord is a little different in that the company, or at least a direct descendant, is still in business and still in audio as a speaker designer and manufacturer. In honor of its 90th anniversary, it has announced that it is re-entering the turntable market with what appears to be a design of high quality, belt driven, with 7% speed adjustment, and offered with plinths in a wide array of eye-catching colors and a custom cartridge based on one by Audio Technica. Unfortunately, as best I can tell this model has or will have only two speeds, 33 and 45. The classic Elac/Miracord turntables were four-speed models. To be honest, I'm not sure how much speed adjustment they offered, or even whether they had any at all, but I'm including them here because they were roughly equivalent in build and market to Dual and on the assumption that at least some of them must have been speed-variable in order to meet the competition. Both these brands made automatic idler wheel designs that, as far as I can tell, were more or less comparable to Dual's in quality and function, sharing the virtue of a removable spindle. The arms fitted to both, however, were robust, heavy-looking affairs with oversized, fixed headshells; I'd hesitate to expose LPs to them, and at the least I imagine they are ill-suited to low-compliance cartridges. Like Dual's arm, each featured a removable cartridge carrier, probably even more difficult to locate and expensive than Dual's today, and in general they share the Strathclyde's failing of hard-to-find replacement parts, although at least they are not laden with aging electronics. 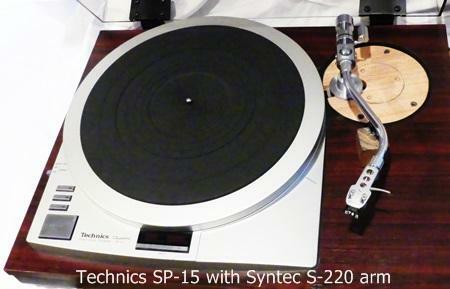 Pros: The SP-15 is one of only four turntables known to me that offer variable 78 RPM capability and a built-in digital speed readout, the others being the SP-10, the Strathclyde, and the Numark TTX-1. Like the SP-10, the SP-15 adjusts speed in .1% increments with pushbuttons, giving it the same capacity for "creeping" the speed as a record plays. It therefore can contend with records that do not maintain constant RPMs across the playing surface, albeit not automatically--but then, I know of no turntable with such an automatic feature. Where the SP-10 has separate units for the turntable/motor assemby and speed control, the SP-15 combines all these functions on a single chassis. Cons: Like the SP-10, the SP-15 features a nominal 78 RPM setting and variability in .1% increments, but the SP-15 offers only a maximum 9.9% deviation, limiting it to a range of 70.5 RPM to 86 RPM, not low enough for very slow-spinning records like Caruso's early ones and not high enough for etched-label Pathes. As with the SP-10 and the Numark, the digital readout is in percent deviation, not revolutions per minute, requiring calculations to determine how to set a desired speed. The most serious problem, however, is a frequently encountered, and from what I've read frequently irremediable, "time bomb" issue with its own unique failure mode: whenever turned on, the turntable spins up to its top speed and sticks there. The design incorporates two proprietary integrated circuits that Technics discontinued long ago; whether they are related to the "runaway train" problem I don't know, but their failure, too, evidently is often or usually fatal. According to the technician who serviced my SP-15 immediately after I bought it, the capacitors on the speed control board always should be replaced to prevent the integrated circuits from overheating, a frequent cause of failure. Cuts both ways: Fitted with a good arm, the SP-15 offers a high level of performance suitable for both LPs and, within its speed limits, 78s. Moreover, the SP-15 offers a way to obtain a good part of the SP-10's capabilities at a lower price. That said, a strong demand for this model ensures it is expensive relative to many turntables better suited to early acoustic recordings. Being intended for broadcasters, the SP-15 is much heavier than the usual run of consumer turntables, and it does not automaticaly come with a plinth; if it does, the dedicated plinth for the SP-15 is very large, even more than the Strathclyde's oversized design. It can be too large or heavy to fit rackage designed for consumer gear. On the other hand, the generous proportions will easily allow for a 12" or longer tonearm, making the SP-15, not surprisingly, a good candidate for playing 16" broadcast transcriptions. The same would be true for 14" Pathes, but here the SP-15's inability to reach 90 to 100 RPM is a distinct limitation. Pro: Built-in arm of decent quality, suitable for LPs and 78s, with interchangeable armwands as described in the previous article. Supplied with a clear plastic cartridge mounting template that greatly simplifies alignment, and antiskating is set by a dial rather than with little pulleys, strings, and weights as with the Lenco stock arm and SME component arms. Built-in strobe, which shines an orange light through cutouts in the platter rim (saw teeth at the bottom edge for 60 Hz current, square holes just under the surface of the platter for 50 Hz). Pitch adjustment is by a single, easily accessed dial, looking like a little poker chip, set into the surface of the plinth, on balance a bit less fussy than the Strathclyde's array of three little vertical wheels in a well but fussier than the individual little knobs of the Fons. Manual setdown of the arm with a cue slider; automatic stop at the end of the record side. Drive belt is easily replaced, not requiring extensive disassembly as in the Fons. As the dust cover is fitted to countersprings mounted to the plinth, it can stand free at a forward angle, unlike the Strathclyde and Fons covers, which must be raised more vertical or leaned against a wall, or the Lenco, which depends on a prop inserted into little wells on the surface of the plinth. Not one of the “in demand” Thorens models and hence likely to represent a good value for your outlay if you can find one. Con: Speed adjustment is only 6%. The TD 115 Mk. II seems not to have been a popular model when new, either, and hence may be hard to find. Shifting to 78 RPM is somewhat fussy, as one must hold down a tiny latch button while moving the speed selection slider. The strobe is for LPs only. Spare armwands, especially if stored in their plastic protective boxes, consume far more space than headshells, and the boxes need a lot of space to open. Mounting a cartridge to an armwand involves selecting and properly orienting several small, asymmetrical parts; attaching them and the cartridge together with screws; and sliding the resultant assembly into slots at the headshell end, a more complicated and fussy process than simply bolting the cartridge to a conventional headshell. Spindle is fixed. Automatic stop can trigger inappropriately when playing center-start records (but recall that the speed variability is insufficient for those anyhow) or those cut too close to the spindle. Most importantly, the “time bomb” issue: the TD 115 Mk. II incorporates an electronic speed control. Mine went bad and was replaced under warranty shortly after I bought the turntable as a floor sample at an Atlanta dealer in the mid-1980s. Last year it went bad again, refusing to shift to 78 RPM, effectively leaving me with a two-speed turntable. At that point, considering that repairs would probably cost more than this unpopular model is worth and already having better turntables in my arsenal, I gave it away to a high school student who was beginning to collect LPs but had no 78s. Garrard 301, 401. Like Thorens, the English manufacturer Garrard produced a wide array of turntables over a span of decades, some with 78 RPM capability, some not. I've had limited experience with the line, most of it with the four-fixed-speed turntable that equipped my father's KLH compact stereo. As far as I know, the two best bets from the Garrard line, which is to say the two with some speed variability around 78, are the models 301 and 401. Conventional wisdom from the LP world, it seems, would give the nod to the former, but from the perspective of the 78 collector the latter is slightly preferable. With only 2% speed variability, the 301 covers a range of a bit under 77 RPM to a bit under 80 RPM,which is to say not quite slow enough for typical Victor acoustics and not quite fast enough for nominal Columbia, Edison, or paper label Pathe. The 401, at 3%, has an upper limit sufficient for the 80 RPM disks, although, as I noted in discussing the similarly specified P/E above, its lower limit is low enough for only some acoustic Victors. Not really suited, then, for the collector of records cut before around 1930. An unrelated problem that may be of more concern: these Garrard models, like the Lencos, have developed a cult following and now are priced to match. For the investment, you can get something more flexible and hence more suited to early 78s. If you don't plan to play acoustic and early electric 78s, however, and fancy one of the Garrards for LP duty after the kind of extensive modification, including replacement of the original plinth and refitting with a high-quality modern arm, that is now fashionable, I would expect you'd be happy with either model. If you do want to delve into the earlier recordings but still want to jump aboard the heavily-modified-idler-wheel bandwagon for LPs, Lenco would be a better choice. Philips GA 202. I mention this belt-drive three-speed turntable in passing, because I'm aware of its existence but have no personal experience with it. In the United States, it was rebadged as Norelco, the Philips US brand name of its day. From what I've read, pitch variability was plus or minus 2%, meaning my remarks about limitations of the Garrard 301 also apply here. As with Fons, pitch adjustment was by individual knobs, one for each speed, although in the case of Philips they featured slotted tops to allow for adjustment with a screwdriver. The included tonearm was a decent looking gimbal-mounted affair supposedly capable of tracking up to 4 grams; like those of the Dual 10xx and 12xx, it required mounting of the cartridge on a proprietary sled that then locked into the headshell. I've seen some reports the design was prone to developing hum with age. I've seen others that sometimes the sled was pre-fitted with a proprietary Philips snap-in cartridge and won't accept standard half-inch mount models. I wouldn't count on finding replacement sleds easily, and if the reports of proprietary cartridges are true I would expect obtaining 78 styli for them to be difficult or impossible. One other design peculiarity is worth noting: the GA 202 relies on not one but two drive belts, a large one immediately under the platter and a smaller one in the motor box. I don't know how difficult they are to access, but I've seen a number of complaints that as they age the belts turn into a gooey mess that is difficult to clean off.